Model 11 Savage is Great Elk Rifle. I am a 56 year old paraplegic. This past Nov 2017. I took a trip to Montana to hunt Elk. On my second day, I shot a very large cow with my model 11 chambered for 308. I hit the Elk just behind the front shoulder. A 150 grain Hornady GMX took out the top of the heart and both lungs. The Elk stumbled maybe 30 yards. After seeing the damage and exit wound I would have no fear hunting anything in North America with a 308 or similar caliber. I am going on my first elk hunt this fall. Going to use my 7mm 08. What do you recommend using for ammo. I want to buy over the counter ammo. Thanks for any help. IMO the rifle one uses for elk should be the one that puts the bullet in the right place. Elk don't require a cannon. The most important thing about shooting an animal, any animal, is where you put the bullet. The second most important thing is what that bullet does. The bullet needs to stay in the vitals and expend it's energy there, not zip right on through and out the other side. Hydrostatic shock and mechanical shock are important components of modern ammunition dynamics, so you want bullets that expand and expend their energy on the target. Far better to put a 165 grain 30 caliber in the lungs and heart than to flinch off a bigger caliber, miss the vitals and have the bullet fly on through and leave you with a mortally but not immediately fatally wounded animal. If you can consistently shoot the big magnums and place the bullet accurately, then by all means, do so. If you find that shooting them is uncomfortable and you're not as accurate, then use a rifle that you can shoot accurately. You'll be doing both yourself and the elk a favor. When I was a wildlife manager in the midwest I worked at and/or supervised a deer check station for about ten years. During that time, I saw thousands of dead deer, bear and other critters. I always enjoyed striking up conversations with the hunters that came in to check their deer; it became an annual event for some folks that I actually got to know quite well over the years. I always enjoyed talking with hunters about their experience, whether or not I could help them find deer, etc. I also enjoyed talking with them about equipment, especially rifles used to take their game. While talking with all these folks I also paid attention to the carcasses in the back of their trucks. What I saw made an impression upon me as to the power of centerfire rifle cartridges and bullets. Good bullet placement (not at the computer, but observed on the animal)resulted in quick, clean kills. Poor placement resulted in the opposite, often with long tracking jobs. It was amazing to me how many of these folks either never mentioned the poor shot or actually thought they had made a good shot on the animal. Many of these were a good 8 - 10" or more behind the front shoulder, which is pretty much borderline on a white-tailed deer. Behind the front shoulder doesn't mean ANYWHERE behind the front shoulder; it means tucked up right against the front shoulder, in my mind 1 - 3" behind. I was also amazed at the number of people who shoot very large cartridges at deer. 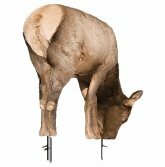 The gaping exit holes on the animals were evidence to me that we need not be shooting what we think we need to be shooting. I am all for 'using enough gun'; the question is "what IS enough gun?". As a biologist, I am certain that if a bullet gets into the chest cavity and destroys both lungs, the animal will die...quickly. It cannot be otherwise. An animal CAN survive, at least for a while, with one lung. But put both out of commission and you have a dead animal on your hands, regardless of jacketing, bullet weight, velocity, foot pounds of energy, and all the other stuff we spend far too much time thinking about. What does this have to do with elk? I have seen the same types of exit wounds in elk camps; gaping holes from 250 grain .338 bullets, 175 grain 7mm bullets, etc. ; bullets ruining the hams and/or backstraps of these magnificent animals. I have no problem with whatever people shoot; I think it was Jack O'Connor who said that 'I draw the line only when they expect me to take them seriously'. Power does not compensate for poor shooting skills. Use whatever you can shoot accurately (but really do some soul searching regarding your personal shooting skill level; nobody else needs to know!). After two shoulder surgeries, I have given up on my .300 magnum. I just cannot take the chance of the recoil pushing anchors into my bone and splitting it. I just flinch too bad because of this fear. But the deer and elk I have killed with a .308 and .270 have died just as quickly, and placing the bullet "behind the front shoulder" is a whole lot easier! Good hunting and good luck!! The best all-around hunting rifle is the .325 super short mag. In 300yds. the drop is only 8" with a 200 gr. bullet and the velocity is 2600-2800 ft. per sec. The Bull Elk I shot with it dropped with one shot and both whitetail bucks did the same. The best rifle is the one that you feel comfortable shooting! And yes I know there are people that are going to say but caliber!! I once saw a friend grab the wrong gun in the heat of the moment and kill a Bull moose with a 223 , moose never took a step. Another guy shot at the nicest buck I ever saw with a 30-06 and the buck ran off missing an ear! 223 enough 30-06 not enough? Probably no to both but if you find a gun you feel comfortable shooting I for one do not want to stand in front of you! Ok back to caliber... I have never been a big magnum person but I settled on the closest specs I could find to a magnum which for me was a bolt action 35 Whelen. It has served me well for 14 years now. I reload up for Elk and down for deer and it has been along time since I needed a backup shot. And no I'm not the best shot in the world I just shoot the gun as often as I can to keep it in line! I shot an elk that doubled up and came to a screeching halt and one that piled up into a tree. Also I have shot deer at different distances and haven't had what some call Blow Out! Entrance hole and exit are usually close to same size! So for me I’m sticking with the 35 Whelen ! Good luck and safe hunting to you all ! Well my favorite big game rifle is my old Pre-64 Model 70 in .300 H&H. However for obvious reasons there are places and weather I don't wish to subject this wonderful old girl too. Soo generally when I am in the hills after Mr. Wapiti I am carrying my Remington Model 700,8mm Rem. Mag. in an H.S. Precision Syn. Stock with a Leupold 3.5X10 scope. She is accurate,hits hard near or far and I don't have to worry about her no matter what mother nature throws at us. Most importantly though it's a rifle I am intimately comfortable and familiar with. This has probably been stated as long as there was such a thing as hunting, but shot placement still rules the day. I would not feel handicapped one bit with a .270 Winchester as long as I used properly constructed bullets and was able to place the shot correctly. Although I have no problem with the big magnums, I think far too many people miss or wound with them because they are afraid to shoot them or are unfamiliar with them. I would much rather see someone hunt with a .270 they shot well than a .338 mag that scares the hell out of them. When we lose an animal I think we all lean toward blaming the gear. But I also think that if we are honest with ourselves we know better. I am a Colorado elk hunter and i have to say give the short magnums a try I have a browning x bolt stainless stalker. Armortough stock, 22 inch barrel, rotary detachable box magazine,325 wsm short mag, 200 grain accubond ct bullets and well balanced. Basically the 325 is an 8mm dia bullet ballistics are very close to the 338 win mag and the 325 actually shoots flatter the foot pounds are around 3200-3450 depending on bullets. from owning all kinds of rifles the Winchester short mags are a great choice for the elk hunter who wants a great easy to carry in rough terrain all day and still wants a powerhouse with great ballistics in a short, balanced,great penetration and a short action rifle the Winchester short mags are a choice worth making. I prefer my 300 win mag but we have 3 270's that have brought down as many elk. It's not so much the caliber as where you hit. We use 165 grain slug in the 300 and 130 grain in the 270. Both have done the job out to 426 yards. We average over 250 to 350 yard shots each year. We have had shots as close as 40 yards but not very often. Regardless what you use just practice that is what makes the difference. I used a 30-06 for many years and killed plenty of elk. It had only one weakness, range. The 30-06 is a great 200 yard elk rifle when using 180 grain bullet. I have since switched to a 7mm mag. 150 grain bullet. It will do at 300 yards what a 30-06 will do at 200 yards. I like both calibers for hunting elk but my favorite is the 7 mm mag. More important than chosen caliber is shot placement, take out the lungs and wheels (shoulder)in one shot, I have never had to track an elk since i was taught this placement, and meat loss is minimal. They simply just fall down. I killed my first elk with a .270. All that is needed is a well placed shot. 30-06 with 180 grain bullet is just perfect. Compared to any other caliber the velocity is pretty much the same, give or take 200 fps. I use the 30-06 but with a 24 or 26 inch barrel. I would most likely have less faith if the barrel was 20 inches. I grew up hunting in Montana, and have taken about 25 elk in 35 years of hunting. Lots of mule deer and antelope too, with a couple whitetails thrown in. So my experiences are not as varied as some but I've done a lot of hunting and reading over the years and have developed some opinions on rifles. On cartridge selection, I killed my first 11 elk with a .270, and none of these animals ran more than few tens of yards and several dropped in their tracks. So I don't really buy the notion that a .270 is too small for elk, as some would have you believe. The 150g bullet traveling at 3000+ fps packs a hell of a lot of energy. I now hunt primarily with a 30-06 using 180g bullets, or with a .300 Ultra Mag with 200g bullets. Why? Well,I guess I like the extra little margin of performance. Kind of like a V8 in the truck versus a straight 6, one is adequate but the other leaves little question that you've got the necessary horsepower in a pinch. Bolt actions are common and cheap but they're not the only suitable action for big game, and have the disadvantage of relatively slower follow-on shots. When a wounded animal is fleeing thru the black timber, the fast cycling gun could be key to finishing the job. I'll also mention that I do also own a single shot Thompson Center but I leave it in the gun safe for elk hunting, where multiple shots are the rule not the exception. No sense in giving up the advantage of the follow-on shot if you don't have to. Optics are also key, and I differ from some in my opinion that most high-magnification scopes are overkill: 4X or 6x fixed is just fine, and my favorite is presently a 2.5X8 variable Zeiss. I would choose something like a 2X7 variable Leupold over higher mag scopes any day, because it is light, well-designed product with great low-light capability. The 50 mm objective seems like an expensive waste of money to me, unless you're poking prairie dogs at long distances at dusk. So take it or leave it, but I'd say a pump or lever action .30 caliber rifle throwing 180 grains of premium lead, with a 2X7 or 2.5X8 scope is about perfect for elk. I use a 7mm rem mag. So far it has put elk down with one shot. Regardless of caliber (7mm and up) used for elk, always choose a bullet that will not mushroom too much and will penetrate well. As stated, elk are made of large bones, heavy muscle mass and a large will to live. The bullet must completely penetrate the body from any practical angle to ensure a clean kill. A fun test of elk-effective bullets is as follows: take two 5 gallon plastic buckets full of water and place them end-to-end with some wood behind them at 100 yard range. Shoot your favorite elk bullet into them. If the bullet does not penetrate both buckets and go into the wood, use them on squirrels! I have tested many so-called "elk bullets" and had them fail this simple test. The poor ones are usually in pieces in the second bucket. The good ones retain over 80% of their original weight. Use them! I have only recovered two bullets from elk that passed this test and both hit multiple bones. To back up my advise, I have killed many elk and seen many killed. I keep autopsy records of bullet performance and have reached these conclusions. Use of a tough, slow expanding bullet has always resulted in quicker kills and less meat damage. I am not going to name brands or types as that would deprive you of the fun of doing more shooting! Have a good time out there. 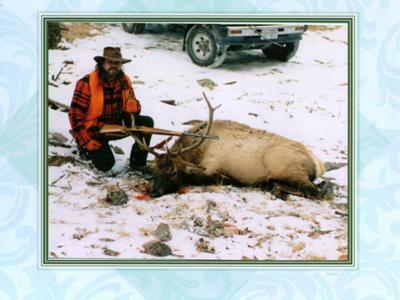 I have used a Winchester 70 bolt action 7mm Magnum for over 30 years , Killed many Elk in that time. This was my choice of Caliber for many years , they do kick hard , but I have never had to go looking for any Elk I ever hit with it . Just about everyone I can remember did get a second round for sure , If it is still movin I am still shooten ... Had few that required a third round, they will always head down to some hidy hole and that is no fun to retrieve them from, This my reason for stopping him as quick and sure as possible. Getting older now, my back hurts, my neck hurts and I have gone to a Tek 3 bolt action 300 WSM . This caliber does a good job, I believe it has just as much punch as my 7mm Mag and it is much easier on the shoulder. The photo above is a Bull taken in the Big Hole , Wise River Montana , just a bit over 750 pounds. One in the Lungs at 200 yards and another in the Neck at 100 yards.Short shot's for Montana but he was runnin out full. I like hunting with an M14 battle rifle for several reasons. 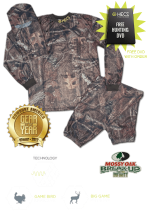 I hunt in Wyoming on the eastern side of Yellowstone park and also around Teton National park where there are many grizzly bears. I hunt alone and have to pack out the elk in numerous trips. My formula for a charging bear is semi-auto ability and large magazine capacity. It is also great for follow up shots on elk. Two possible objections are light caliber (.308) and a bolt action's rep for greater reliability. As to reliability, the M14 is a battle rifle, tested in battle, is one rugged and utterly dependable weapon. It fires reliably in 20 below zero or 110 degrees, and never malfunctions. As to caliber, I reload using BarnesX bullets, 165 grain, loaded to close to 2800 fps, exact same ballistics as a 30-06 which has taken every big game in North America. Shoots a 1 MOA group, a little heavy at 9 lbs, but recoil is negligible. It has a bedded natural striped birch stock with a tung oil finish. Heck, half the fun for me is hiking around in the most beautiful wilderness anywhere with a fine rifleman's rife, the elk is a bonus. I have read some of the comments below on this topic and am really just starting to look at and get familiar with different types of guns. I did some deer hunting as a kid in Michigan. I am in the military and haven't had the opportunity to do a lot of hunting the last few years, but I am getting ready to move to Montana and can't wait to learn all about and try my hand at some elk hunting. I have an old .303 British rifle and would love to hear some of the opinions of others with a little more gun experience than myself. I know that most .303 bullets come in 150 or 180 grains and that it drops off some outside of 250-300 yards. Any thoughts? I have found the 270 is a good choice when using Berger or other high-end bullets. Of course shot placement is a key to success. If you don't have a clear shot then you have no shot, IMHO. Drew a tag for Colorado Cow elk. Wish me luck. One well placed shot does the trick each and every year. I choose to hunt with a .45.70, it is a good overall brush gun where most elk are found, and has enough impact to put an elk down if the shot is placed well. A head shot does it if you don't want a Trophy mount. Best North American BIG Game rifle. I like BIG GAME and that is not found in the mid west. Sometimes it is the other things in the woods that place you in a lower point on the food chain than when you were sitting in your truck. It is not that you need anything hotter than a 270 to kill your intended species but, when bears are around I carry a .340 Weatherby. 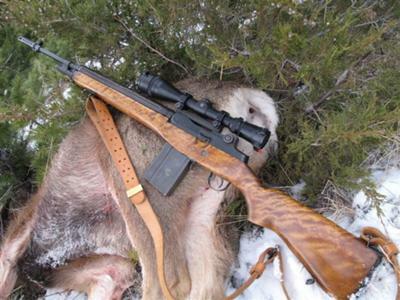 It is a dead right now rifle that I want fully loaded when dressing a moose in bear country. My FAVORITE elk rifle is my Marlin 1895 chambered for the venerable 45-70 Gov't cartridge. I reload my own, so I am able to get a 300 grain Nosler Partition flying at about 2,300 fps. It makes for some serious punch on the receiving end. Shot clean through a 16" quakie once....last seen heading toward the Oklahoma panhandle. Shooting it is not any different than a mid-12-gauge load. The recoil pad makes it much more delightful than my 300 Weatherby. That said, I know my shots have to be inside 250 yards. That distance will keep me within a 6 inch circle, when zeroed at 200 yards. The drop after 250 is a bugger. OK I am not an Elk hunter but I am a Moose hunter. The 358 Norma with 250 Noslers is pretty sweet. Mine is in a 7 pound Ruger with a 2.5X Leupold and I am pretty happy with it. Penetration and wound channels are outstanding and recoil is not too bad. 225 Accubonds are good too. I prefer my 45-120 Remington rolling block. 535 grain bullet has plenty of stopping power, and yes, I hunt my black powder loaded rifle with the modern boys and do just fine. An old J.C. Higgins model 50 in .30-06 comes to mind. Built on a butter-smooth FN action with a well-worn walnut stock. The "poor man's model 70", as it were, just has elk rifle written all over it! 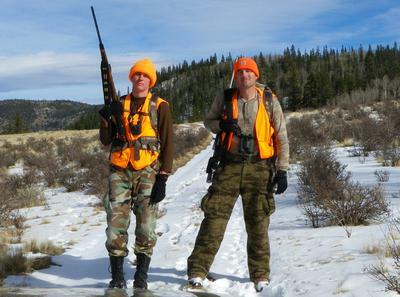 The best elk rifle is the rifle you're most familiar with and can shoot the most accurately. On elk or any game animal shot placement is crucial. You must hit them right. Know your anatomy of the game animal you're hunting. With 150gr bullets I have never had to take a second shot. I have taken spike bulls, cows, 5x5 and even a big 6x6 and they have never taken more than 10 steps after the shot. My father uses a 30-.06 and his friend uses a 7mm. They have always ribbed me, but they haven't been able to compete. My opinion is that you can use something smaller than a .300, but no matter what caliber you use .270 or above you must know your rifle and your limitations! But I guess that goes for every gun and every hunter. 6.5x55in 156gr Oryx up to 300yd,or 156 Alaska to 250yd. Unbeatable punching power. 156 Vulkan lung shots are also conclusive. One shot kills every time. Elk,moose,grizzly,whatever. It just kept our family in northern Canada fed and protected for over 40 years with unfailing killing power without over smacking the meat. The rifle I use for all of my big game hunting is an old Mauser bolt action single shot chambered for 30-40 x.315 Ackley Improved. I can load this round from standard 30-40 Krag velocities up to .300 mag speeds. I usually load it to '06 velocities with a 165 gr. bullet. My late father had this gun for years. It was chambered for the Ackley round by Old Man Vickery down in Boise, ID back in the '50s. This is the only single shot Mauser I've seen. It's called a VK-98. Uses the standard Mauser 98 action with no magazine. Apparently the Nazis started building them near the end of the war as an economical rifle with which to arm the general populace. They used all sorts of barrels and mine has a bore diameter of .315 and no bullets of this diameter are available commercially. I take standard .323 8mm bullets and run them through a swage and squish 'em down to .315. It actually shoots .312 bullets designed for 7.65 Argentine pretty well. For all intents and purposes this round is a 30.06. In my opinion any caliber commonly called 'big game' will work well on elk. One of my neighbors has killed more elk than anyone I know and he shoots an old Mod 99 Savage chambered for .300 Savage. Another neighbor shoots a .243 Rem. 700 and kills an elk a year. Caliber is not nearly important as where the bullet goes. Guns I like for elk! I think the gun you shoot Elk with should be one you shoot a lot with. It feels comfy in your hands. I do like the .308 clan a lot! I guess I shot a 300 mag and killed every animal I shot at, but I got a back injury now. No more mags. I have shot lots of game with the .308 win but with a good 180gr. is the name of the game and the 30-30 win on deer. My brother always preached the 180gr. rules for Elk. Once I shot a cow with .30-06 150gr., lung shot. In the confusion she got a way. Never seen Elk run in a circular pattern in farmer's field. I like my .30-06 it feels good to shoot with, but I use 180gr. now! Yet my other brother has shot 4 with the 243 win. Some at 300 yards. Everyone is different. Personally I think the 243win. is to light! I like the 30-06, or .308 win in synthetic stock because they are light to carry up in the mountains, still have good knock down power. Put the bullet where it should go = dead elk. I use a cow elk call to bring them in close most of the time! Oh, I also shoot both guns good, with shot placement good, as I like both of them a lot! 30-06 is a Savage. .308 win is a Marlin. Both are bolt actions. Good hunting! -Be safe! 10 mo ago purchased a 270 WSM from Gander Mtn. after 4 shots the barrel floated, solid to the left against the stock. I returned it to GM 9/8 thinking, they will replace it and I'll be on my way. They said " We have to mail it to the dealer." Bull, they sent it to a gunsmith. Sept 22 no gun, they promise phone calls, no phone calls and I asked them "So, do I hunt with a bb gun?" Their brilliant answer, "Well, if you request it be returned we can refund your money but not until the gun is in our hands." Now its October 24, I was gone a month, bought a new 270 in Tn, didn't get an Elk (probably not the guns fault) and went in today to be told "We don't know where your gun is, it show's it was sent for repair Sept 8 so we'll call them Monday." I proceeded to scream at them and told them I want my $1200.00 back and the dumbell says,"You'll have to talk to management about that. I'm talking to a lawyer Monday. This has gone too far and I don't recommend Gander to anyone. BTW/I had a great vacation, fun hunting in Co, saw Moose, Elk, coyotes, a Mountain Lion and got the hell sunburned out of me and I'm a Va outdoors guy. I've killed elk with a .30-06, and I know that accuracy and shot placement are far and away the most important factors, at least once you've found them and have a shot. But I found myself passing up long shots because I wasn't convinced that my ought six would have enough energy to blast through a shoulder out past 400 yards. I had some "deployment cash" from a tour in Iraq, and found a lightweight Kimber Montana in .325 WSM. I have no regrets. The last elk I killed was a cow, and I lased the range at about 550 yards. I fired near last light into a setting sun, sitting and using a pair of shooting sticks for support. The 200 grain Nosler Accubond bullet punched through the point of the left shoulder and clipped the front of both lungs. Was there some luck? Sure, but there was some skill too, due to practice and confidence in my weapon and my handloads. She moved on, but it didn't take too long before she curled up and was down for good. The .325 is deadly accurate and devastatingly powerful. Accubond bullets fly true and penetrate deep, and hang together while smashing the thickest bone. On deer and elk my Kimber Montana has proven to be completely dependable and fun to carry. I'd use it for ANY North American big game, including Alaskan brown bears. Although many writers say it is a caliber that "didn't catch on" the new Cabelas store up the road had three used rifles for sale recently (a Kimber Montana and two Browning BLRs) and all three were snatched up before the start of elk season. I believe that the .325 WSM is the ultimate elk caliber, and many hunters/reloaders here in the Rockies have figured that out. I shoot Hornady Lever Evolution 200 gr. FTX for lever action carbines. They help me achieve 1 moa at 100 yds and 3 inch groups at 200 yards on a good day. I have a chance to go elk hunting this fall but I know my 30-30 isn't the right gun for the job. Any suggestions as to what would be a good gun for elk hunting? Keep in mind I don't want to spend a fortune as it will most likely be a one time deal. Well I thought you people had a registration for this forum but I don't seem to find it any where. 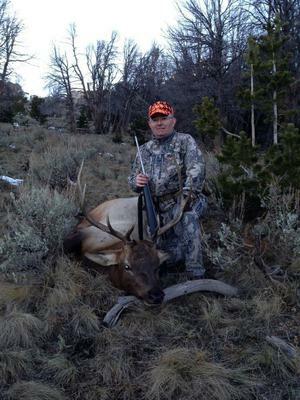 Yes, I hunt elk the old fashion way, using my knowledge to get up close, not shoot elk at 400, 500, 600 yards etc. Most of my elk and other big game animals were taken within 150 yards. I been doing this for several decades too. I started Elk hunting in Wyoming and my personal choice is a Kimber Montana .325 WSM. Hunted 2009 and harvested a 5x5 Elk at 200 yards. Hunted 2012 and harvested a 5x2 Elk at 85 yards. Hunted 2013 and harvested a 5x4 Elk at 295 yards. IN 2012 and 2013 I shot a load worked up by Superior Ammunition which uses a 220 gr Swift A Frame bullet. Great bullet which performs well on large game. My rifle is set for a 200 yard zero. This load shoots a half inch group at 200 yards out of my Kimber. My Kimber does not like the lighter bullets available and does not group them well at any range. My hunt this year was noteworthy in that it took a day and a half to get from Dallas to Elk Camp. We unpacked in camp, ate lunch, rested a while then went out on horseback toward the area we were going to hunt at 3:00 PM. At 5:30, after two hours of bull bugling and cow calling by my guide which were answered by 5 bulls with cows in simultaneous we had a 5x4 walk out moving directly downhill toward me at about 400 yards. I waited and he came closer and started rubbing his antlers on a small pine tree at what I estimated to be 350 yards. The shooting school I attended this year in April really paid off. The Elk was facing me with his head down presenting a 4 foot tall by 6 inch wide vital area target. I built my house for the shot using the tree I was behind as one leg of my tripod and took the shot. It was a perfect shot going in the neck high enough to miss both front shoulders. The bullet hit the jugular going in and sent a shockwave which shredded the lungs and damaged the liver. This shockwave also must have damaged the brain. My ELk did not even twitch once. He was dead when he hit the ground. My guides laser rangefinder showed 295 yards from the Elk to the tree I was behind. .325 WSM in the Kimber Montana is a great rifle for hunting at altitude. When you have an Elk in the scope you do not feel the recoil. However, a day at the range with this rifle on the bench is for me a five round day. I have other lighter recoil rifles with which to practice. This years experience with 5 Elk with cows on the same mountainside was an all time great experience for me! Is a 308 rifle enough for elk hunting? I recently bought a Mossberg in 308 caliber. I am wondering if that caliber is ok for elk hunting using 168 grain bullets. Thoughts? and thanks. Hope you all get an elk this season.